Nigeria edged closer towards qualification for the 2016 Rio Olympics with a 2-1 victory over Congo Brazzaville in Port Harcourt. It was sweet revenge for Nigeria whose senior side lost 3-2 to Claude Le Roy's Congo last year in a 2015 Africa Cup of Nations qualifier - a result which ultimately denied the Super Eagles a place at the finals and a chance to defend their title. Nigeria boast a proud Olympics football record, having won gold medals at the Atlanta Games in 1996. 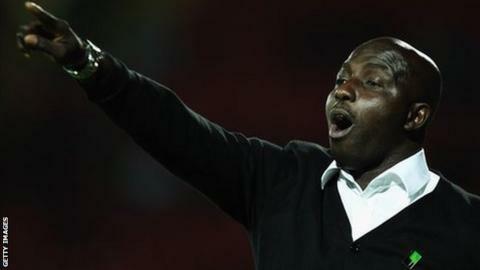 They also finished runners-up at the 2008 Beijing Olympics, where current Nigeria under-23 coach Samson Siasia (pictured) also coached the 'Dream Team' in China. On Sunday, it was Junior Ajayi who proved to be Siasia's match winner, scoring both goals just after half-time, in front of 35,000 home fans. Le Roy's Congo pulled one back in the 68th minute - but Nigeria held on to seize the first leg advantage in the under-23 level third-round qualifier. The return match is scheduled for early August and the overall winners qualify for an end-of-year tournament in Senegal from which the top three teams out of eight go to Rio. Elsewhere, a late goal blitz helped Egypt overwhelm Uganda 4-0. The Baby Pharaohs led after eight minutes in Alexandria and added three more goals in the last 15 minutes to build a huge first-leg lead. Mahmoud 'Kahraba' Abdel Moneim - bagged a brace and Mohamed Salim and Ramadan Sobhy were also on target. Egyptian TV commentators angered Uganda coach Milutin 'Micho' Sredojevic (pictured) before the match by labelling his team a "punching bag". It looked as though Micho might have the last laugh as the east Africans recovered from falling behind to a Salim goal and even came close to levelling soon after half-time. Uganda captain and leading scorer Farouk Miya found himself one-on-one with goalkeeper Mosaad Awad, but failed to score. Egypt coach Hossam El-Badry turned the tide back in favour of a country that has played at Olympics football tournaments 11 times by introducing midfielder Ahmed Rafaat midway through the second half. Rafaat set up goals for 'Kahraba' and Sobhy as the Ugandans wilted under relentless pressure. 'Kahraba' completed the rout in stoppage time by rounding goalkeeper Omar Salim and stroking the ball over the line. Adama Niane became the leading scorer in the African qualifying competition, taking his total to four goals by snatching the winner as Mali defeated Gabon 1-0 in Libreville. Niane, who is with French club Nantes, scored 13 minutes from time. Gabon were shock winners of a pre-London Olympics tournament in Morocco four years ago having eliminated Mali en route. Zambia forced a 0-0 draw with Ivory Coast in Abidjan despite having to play much of the second half with 10 men. Defender Boyd Mkandawire was sent off on 62 minutes after being shown a second yellow card, but the Ivorians failed to take advantage of their extra man. South Africa, whose previous Olympics appearance was in Sydney 15 years ago, drew 1-1 with neighbours Zimbabwe at the Rufaro Stadium in Harare on Sunday. Keagan Dolly put South Africa ahead in the 67th minute before hosts Zimbabwe were awarded a penalty seven minutes from time, with Walter Musona successfully converting. Sierra Leone conceded two first half goals as they lost 2-0 to Algeria in Blida. The second leg will also be played in Blida as Sierra Leone are unable to host matches due to the outbreak of the deadly Ebola virus in the country. Sierra Leone will nominally be the hosts for that match which has been brought forward to 25 July at the request of the SLFA. The overall winners will qualify for the African Under-23 Championship in Senegal from 28 November- 12 December 2015, with the top three at the tournament progressing to the Olympics. Olympic qualifiers are restricted to footballers born on or after January 1 1993, with three over-age stars permitted at the August 3-20 2016 finals in Brazil.